Is there anything we car enthusiasts hate more than car thieves? Don't be fooled the mainstream media, which portrays them as heroic cool guys out to rescue their little brothers from the mob and then hook up with Angelina Jolie afterwards. Make no mistake — car thieves are assholes. 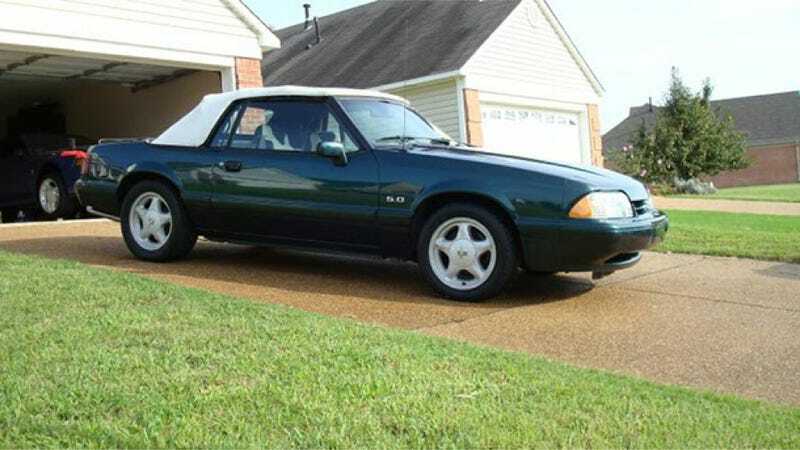 Even worse are car thieves who target rare Fox-body Mustang convertibles named after sodas that no one likes to drink. That's exactly what happened in Colorado Springs this week, as insurance saleswoman Trisha Moynihan found that someone had stolen her 1990 "7 Up Edition" Mustang, according to KKTV. Yes, there is such a thing as a 7 Up Mustang. And it is quite rare. Only about 4,100 of them were ever produced, according to Mustang Monthly, as part of an aborted promotion that was supposed to give them away to half-court shot winners at NCAA basketball games. (7 Up must have been on one hell of a marketing blitz in the early 90s, the same era that brought us the Cool Spot video games.) That never happened, but the few green 5.0 'Stangs with white convertible tops that were made were sold to lucky enthusiasts. Back to Trisha. Her 7 Up 'Stang was stolen from her business around 3 a.m. Tuesday. The theft was captured on camera, and the video is quite hilarious at times — the idiot thief starts throwing himself on the soft top to break in at times. Sadly, it worked. The plate number on the car is 939-UNJ, the TV station reported. Obviously, a green-on-white Fox Mustang is kind of an unusual sight, so if you see it out on the roads, please let law enforcement know. Hopefully it will get returned to its rightful, presumably 7 Up-loving owner as soon as possible. Hat tip to Right Foot to Boxer!